This article was written in April 2015. In March 2016 Jamie Scott left Rocca and set up his own restaurant called The Newport, situated between St Andrews and Dundee. The Masterchef franchise must surely be one of BBC Television’s biggest successes. First broadcast in 1990, the series in which amateur cooks compete in numerous rounds of culinary challenges to be crowned the ultimate ‘Masterchef’ has produced several spin-offs following the same formula: ‘Junior Masterchef’, ‘Celebrity Masterchef’ and, perhaps most intriguing of all, ‘Masterchef: The Professionals’ in which working chefs are subjected to similar challenges over several weeks. 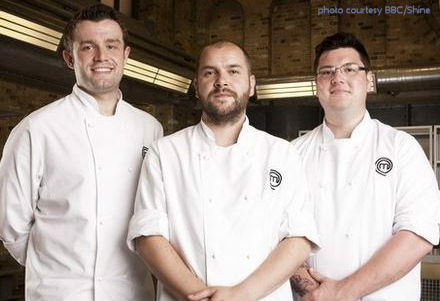 In the 2014 series of Masterchef: The Professionals, three talented chefs battled their way through to the grand final on 23rd December. Winchester-born Sven-Hanson Britt (left) was joined by two Scots: Brian McLeish (centre) and Jamie Scott (right). Jamie Scott from St Andrews was eventually crowned as Champion, with Brian McLeish who cooks just up the coast in Aberdeen, as runner-up. I noted the coincidence that both are chefs in cities to which I am a regular visitor, and it crossed my mind that I must try their food at some point. 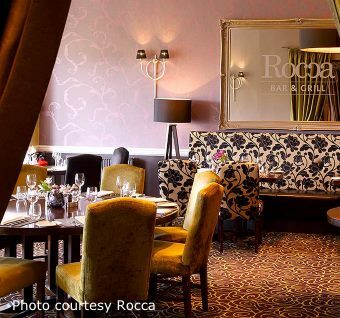 Winner Jamie Scott’s Rocca restaurant is within a 4* hotel that sits opposite the 18th green of the Old Course in St Andrews, catering for golfing parties and tourists visiting this ancient Scottish town. 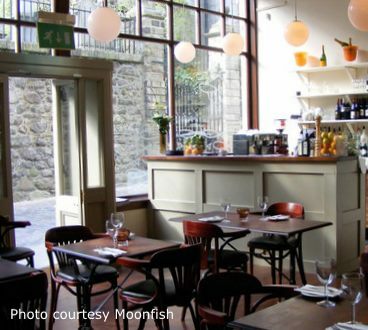 Moonfish Café, by contrast, is an intimate restaurant tucked into a historic lane in Aberdeen’s old town. Very much a neighborhood restaurant, even our local taxi driver struggled to find it. Rusacks hotel is part of the 45-strong, mid-market McDonalds hotel group of 3- and 4-star properties. I would guess most of the clientelle is there because of golf in one way or another. On entering the main reception area I was rather taken aback by a 6′ high, pop-up poster with a larger than life Jamie Scott and shouty headlines that he was ‘2014 Winner’ of Masterchef. Between there and the entrace to the restaurant itself, I counted four more posters on the same theme, and later discovered even more pinned around the hotel, including in the gents and ladies toilets. Entering the restaurant, the manager explained that the ‘Masterchef tasting menu’ contained dishes “Actually cooked by Jamie on Masterchef,” and the à la carte menu also highlighted various dishes with a little Masterchef ‘M’. Discreet, elegant, subtle it was not. As it was the first time any of us had dined in Rocca we decided to have the tasting menu, at £65 for five courses. The food was very good, based on superb local ingredients, but rather inconsistent. A promising start delivered good gougères, sablé biscuits and breads to the table, but the first ‘as featured on TV’ course proper was a disappointment: a quenelle of white East Neuk crab and cubes of apple jelly sat in the middle of a bowl, onto which ‘Arbroath Smokie Veloute’ was poured from a jug. Two of these were poured with a large dollop of soupy cappuccino plopping into the dish, but the others delivered a thin stream of liquid. The result for my companions who drew the short straw was not a velouté (from ‘velvet’, the sauce should be thick, creamy and rich) but a very thin and surprisingly tasteless soup. By contrast the next course was a highlight: a large, plump and deliciously well-cooked hand-dived West coast scallop came with a terrific array of textural and flavour accompaniments, including a sliver of Iberico ham, thin slices of toasted hazelnut, braised chicory and fresh blood orange. Real flavour fireworks here, and a stand-out dish. We were advised the main course of smoked sirloin of Orkney beef would be cooked pink and ‘sous-vide’ (in a water bath at low temperature). That is what was delivered, but I have to say nobody really raved about it: the beef had not been seared effectively, so there was no caramelisation of the outside, giving a slightly unattractive appearance and texture. Luckily a small piece of glazed short rib was lovely, as was a tasty shallot purée. Overall, we agreed this dish was ‘good’. Both desserts were excellent. First up, a Brillat Savarin cheesecake that was tangy and moreish, with a creamy lemon sauce and delicate little macaroons and meringues, then a rhubarb soufflé served with rhubarb ripple ice-cream, that again was successful, light and well flavoured. B.M. (Before Masterchef), Rocca was billed as essentially an Italian restaurant and it has a good wine list, with special selections from Masi and Antinori, though mark-ups are pretty fierce. We drank the ‘Passo Doble’ from Masi at £40.95 (£10.99 retail) for example, whilst you can buy a bottle of Château Les Ormez De Pez 2003 for £22.08 from Bablake Wines, or for £149.95 from Rocca’s list. The other problem was service. The maître d’ was just a little too effusive about the Masterchef connection and in his descriptions of the dishes, whilst at the same time things fell apart in the actual delivery: the entire party eats the same food on the tasting menu, yet too often the dishes did not arrive together: a detailed description of each element on the plate was delivered with half the party staring at an empty space where the dish should be, water was never topped up unless requested, and the arrival into the near empty dining room of a large group of golfers – around 30 middle-aged men in pastel-coloured knitwear – was the final nail in the coffin for service. Our party left Rocca agreed that it was not an experience we would repeat. I feel real sympathy for the young and clearly very talented Jamie Scott. This style of elaborate, intricately constructed, very Michelin star-style food really does invite complaint if it is not absolutely perfect. He is attempting to produce this in the context of the hotel’s vulgar exploitation of his Masterchef win, and the challenge of delivering self-consciously ‘fine dining’ within a hotel catering for big parties with other interests. For my money, runner-up Brian McLeish’s Moonfish is the real deal. The restaurant is immediately reassuring: no white linen, suits or over-selling of Masterchef here. Indeed, the hype is entirely absent with not a mention of the M word on the menu, website or around the restaurant walls. Though the Scottish press in particular gave reams of coverage at the time of the Masterchef final, tonight the packed dining room had the quiet buzz of regulars going about the business of enjoying some exceptionally good and serious food in a casual and relaxed environment, where chatty staff balanced terrific attention to detail with a friendly lack of pretention. The dining room seats around 30 at simple wooden tables, with a seasonally changing display of paintings from local artists around the walls. One unusual feature is the 20-strong gin list, with an array of exotic gins and gin-based cocktails offered as an aperitif, though we chose a bottle of the gorgeous Perle sparkling wine from Ferrari of Trentino. That also gave an early indication of this establishment’s approach to wine: retailing at £27, Moonfish’s price is an extremely modest £34.95. Indeed the entire, single-page list is a joy for the wine drinker: we also enjoyed the Grüner-Veltliner from Yealands Estate at £25.00 (£13 retail) and delightful Moscato d’Asti from Fontanafredda at £22.00 (£9.00 retail). Moonfish’s Menu is also a model of brevity, a single side of A4 with only four choices at each course. Like Rocca, there is an emphasis on quality local ingredients, but in Moonfish’s case that transfers more successfully from paper to plate. After a really nice amuse bouche of spiced smoked haddock with a herby salad, I kicked off with beef shoulder with carrot, gherkin and coriander. What arrived was a pavé, or a sort of squared-off croquette, of melting slow-braised beef inside a thin breadcrumb case, ringed by fascinating textures of caramelised slices of carrot, strips of pungently sweet and pickled gherkin and plenty of aromatic herbs. It was a lovely starter, the meat so moist that no sauce was needed, though I have to say the hake and chicken dish of one of my companions, with artichoke and a Sherry sauce, looked stunning too. My main course was brilliant and, like the starter, utterly inventive: a lovely plump piece of roasted halibut sat on a mound of earthy mushroom duxelles, the only other thing on the plate, apart from a little pool of pea purée, a mound of the most delicious salad of cooked wild mushroom, fresh peas, and heaps of tarragon and dill. This was a truly original dish, not formulaic in the way of so much ‘fine dining’, and crammed with flavour. Pudding was perhaps the highlight of the entire meal: billed as ‘Pear, rosemary, peanut, cream cheese’, it was essentially a deconsructed cheescake, but superbly done: miniature pears had been poached and served with luscious little piped peaks of the creamy cheese and smooth peanut caramel, swirled with a rosemary-infused sauce. It was all about flavour. In all, I would say I had enjoyed a sensationally good meal, although to be fair, all of my dinner companions raved about their own dishes throughout the evening too. Over very good coffee from a local roaster and homemade tablet, we discussed just how much of a contrast there had been between the whole experience of this meal, and Rocca the night before. Three courses costs £35.95, and with two extra bottles of wine plus coffees, the bill for four was £100 lower than at Rocca. Whilst I enjoy the style of dining delivered by Moonfish more and more these days – superb food from passionate chefs, delivered in simple and informal surroundings – I am also a huge fan of the more formal, and no doubt some would say, more old fashioned tradition of ‘Haute Cuisine’. Dinner at Le Gavroche, Andrew Fairlie or The Waterside Inn is an extraordinary sensory experience. But Rocca seems afraid to let the quality of Scott’s cuisine speak for itself. It’s time to ditch the Masterchef overkill, take some pressure off of Jamie Scott and his front of house team, and allow the food to stand on its own merits. I can’t help feeling that the management behind such a talented young chef as Jamie Scott could learn so much from the way his defeated rival from Masterchef has gone about his business. Less, in this case, was definitely more.